TIP OF THE DAY: Pairing Wine & Cake For A Dessert Party…Or Just Dessert! Want a dessert party that’s different? How about a wine and cake tasting? As with any other food and wine, the right pairings enhance the enjoyment of both components. So as not to stress the budget, you can make it a co-op party, assigning different cakes and wines to the participants. Select five or so pairings for a group of 10-12; more for a larger crowd. We made all of the cakes as sheet cakes, easy to cut into squares or slivers. It’s tough to cut thin slices of layer cakes. Place each cake on a platter with a place cards or index cards to identify them and provide cake/pie servers so people can help themselves, and further cut the squares for smaller tastes. We set everything on a buffet: the cakes with the matching wines and wine glasses behind them, plus serving plates, forks and napkins. Re the cake/pie servers: It’s nice to have a server for each cake. You can borrow from friends, use metal spatulas and other items you already have, or buy this inexpensive set of five for $11.99. These pairings were created by Alice Feiring, an award-winning wine writer and book author; and sent to us by Amara.com, an elegant lifestyle website. Alice has provided explanations for why these pairings work (the “Why,” below). If your crowd is interested, you can print the information index cards underneath the name of each cake and wine pairing. Wine Type: Off-dry sparkling wine, such as a demi-sec Vouvray from the Loire region of France. Why: Off-dry sparkling wines with a hint of apple or lemon are a perfect pairing. Wine Type: Pear cider (an off-dry hard cider also called perry). Why: Pears and cardamom accent each other so well in recipes; the same pairing translates to wine. You can also try this pairing with other spice cakes. Wine Type: Ice cider, similar to ice wine, but made with apples instead of grapes. Why: Carrot cake has spicy flavors and creamy frosting, both of which pair well with the intensity, acidity and honey notes of ice cider. Wine Type: Aromatic wine, spicy and exotic, such as Gewürztraminer from the Alsace region of France or from Germany. 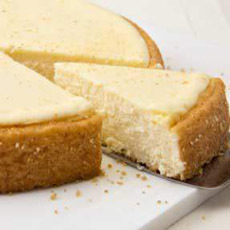 Why: Aromatic wines stand up to dense cheesecakes. The low alcohol level is right for the creaminess. Wine Type: Sparkling, white, gently sweet desert wine, such as Moscato d’Asti from Italy. Why: The light sweetness of a sparkling desert wine complements the less sweet coconut. Wine Type: Oxidized, fortified wine such as Madeira from Portugal. Why: Fortified wines that have been exposed to heat develop a complex muted, caramel-like saltiness—think toffee, dried fruit and orange rind—which complement the ground nuts in the cake. 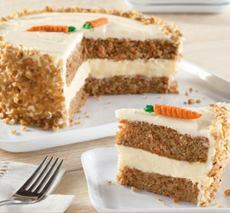 Carrot cake with cream cheese frosting and filling (photo courtesy Harry & David). A classic cheesecake (photo courtesy Cinderella Cheesecake). 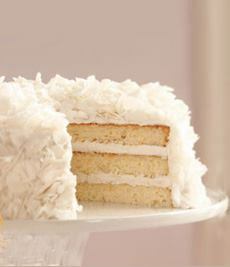 Coconut layer cake (photo courtesy Taste Of Home). 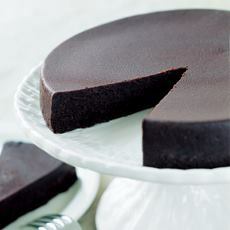 Flourless Chocolate Cake (photo courtesy David Glass). Strawberry shortcake (photo courtesy G Bakes). 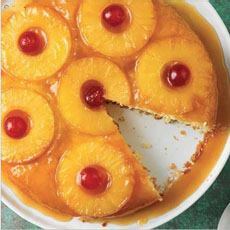 The retro Pineapple Upside -Down Cake (photo courtesy King Arthur Flour). 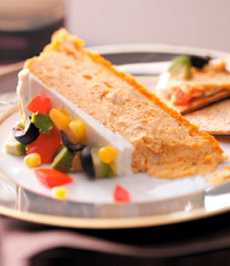 A savory cheesecake (Nacho Cheesecake photo from Taste Of Home; the recipe link is at #12). Wine Type: Apple mint vermouth (look for Uncouth Vermouth Apple Mint)—semisweet and fragrant. Why: The bitter from the vermouth accents the almost fruity snap of the poppy seeds. Wine Type: Sparking white wine, like a slightly sweet Malvasia Dolce Frizzante from Italy. Why: The aromatic lightness of a slightly sweet sparkling wine matches the dense olive oil without being overpowering. Wine Type: Dry amber (orange) wine, spicy with notes of orange blossom. Look for amber wines from France, Italy and Australia—they’re relatively new in the U.S.
Why: The juicy, slightly tannic wine supports the strong cake flavors without undoing the power of the chocolate orange combination. Wine Type: Sweet white wine such as a Jurançon Moelleux from France—unctuous with good acid and lemon/peach notes. Why: The tropical flavor from the grape, petit manseng, especially from the Jurançon, marries the syrupy fruit. Its extreme acidity keeps the match fresh”. 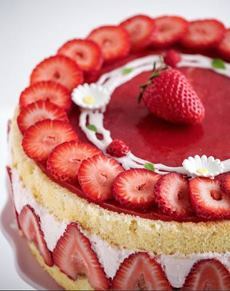 Why: The berry fruitiness of sparkling rosé echoes the fragrant strawberries in the cake. Why: Deep red wines are a great match for the sharp cheese flavors.